Earlier this year Amy Johnson Crow posted a challenge on her blog No Story Too Small to write about a different ancestor each week. 52 weeks in the year, 52 different ancestors. Nothing like starting a challenge a month late, but at least it motivated me to finally start a blog. There is no better ancestor to start with than my paternal grandmother Bessie M. Bromagem. I never met "Grandma Harvey" as she died two years before I was born. But I grew up in the house she had lived in. And more than once an older relative told me I me I was her "spittin' image". It was curiosity about her story that prompted my first genealogical research almost 40 years ago. Bessie was a mystery. By the time my father was born she was suffering from debilitating mental illness. When I asked about her the answer was "she wasn't quite right in the head". But I had also heard stories that one of her childhood teachers said she was the smartest student ever to attend school in Patoka, Indiana. Even in her later years she would surprise the family by performing tasks they thought she would have been incapable of. Once a father-to-be stopped at the house when he realized he wasn't going to get his wife to the hospital in time. Bessie took charge and delivered the baby. I had to know the rest of her story. There were no family stories passed down through Bessie. My recently married parents as well as other extended family members were living with my grandparents when their house was destroyed in a fire. Any photographs, papers or letters that might have existed were lost. Bessie had no siblings except for a half-sister "somewhere back in Ohio". I had to start from scratch, and with no internet to help me. With such an uncommon name I thought it would be easy to trace, but I had no idea of the spelling variations I would find. Bessie M. Bromagem was born 7 July 1881, most likely in Patoka, Gibson County, Indiana. She married George Harvey 4 September 1904 in Princeton, Indiana. She died 2 February 1951 again near Princeton. George was the informant on her death certificate and gave her father's name as Samuel Bromagen. He apparently didn't know her mother's maiden name as that was left blank. I was learning more about the Bromagem family in Gibson County. I found William S Bromagem, Hannah E Bromagem and Bessie M Bromagem living near Patoka in the 1900 census. In the 1880 census I found Samuel Brumigen, Lizzie Brumigen and a 3 year old daughter named Mabel in the same area. Another look through the death records and I found that Mabel Bromagem was born in 1876 and died 22 Sep 1883. And there was a son, Samuel Arthur Bromagem born 1885, died 1886. So Bessie was not the only child of who I now know to be William Samuel Bromagem and Hannah Elizabeth Townsley. She was just the only child to survive til adulthood. The woman on the right is Bessie Bromagem. The woman on the left is her half-sister Mattie. And in the lower left hand corner was a faint mark from a photography studio in Xenia, Ohio. Could "somewhere in Ohio" be Greene County? Once I knew where to look I took things fell into place. Bessie Bromagem's ancestors were some of the earliest settlers in Cedarville, Ohio. I'm sure you'll be hearing about some of them in later posts. But I still didn't know much more about Bessie's life after she married my grandfather. Then serendipity struck. A man named Wilbur Bell drove through Princeton and saw the sign for my father's business: "Ed Harvey Farm Supply". He stopped, since the reason for his trip was to try to find some of the Harvey family that descended from his mother's half-sister Bessie. He was Mattie's son. My mother gave him my address and thus started a long and mutually beneficial exchange of information. Two of the many items Cousin Wilbur gave me were a postcard and a letter. 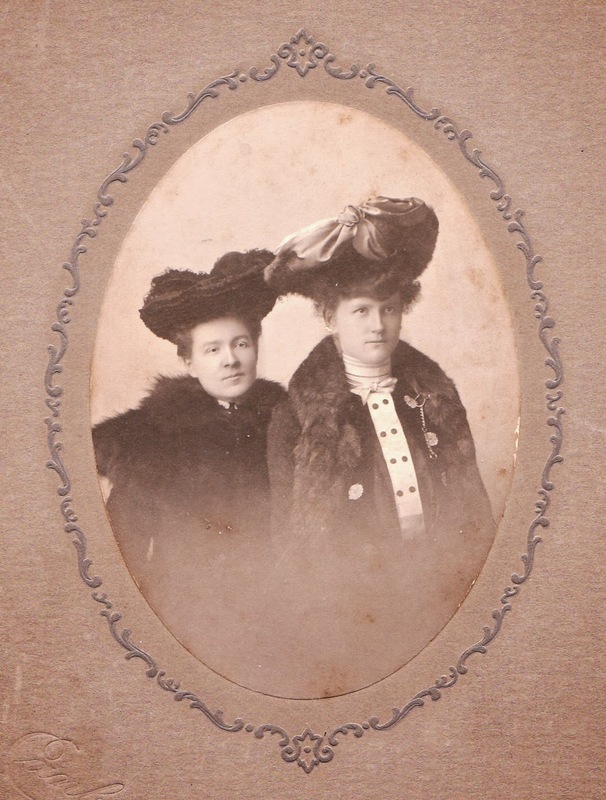 The postcard was a photo of Bessie's two young daughters sent to Mattie. It is a well-written, typically chatty card and Bessie mentions she is getting ready to have some dental work done. The letter was written several years later. One of Bessie's cousins had been visiting Princeton, stopped to see Bessie and afterwards wrote to Mattie to tell her of Bessie's deplorable condition. What happened between the postcard and the letter? What turned this intelligent, educated woman into "crazy Bessie"? By this point I was not letting the discomfort of the older generation stop me from asking questions. I did get some answers, but not all. After my two aunts were born Bessie had a miscarriage. The dental work she had mentioned to her sister did not go well. Those were two of the several different events that people said were to blame for Bessie's breakdown. I found out she had been agitated enough that she was committed to an institution for a time and given shock treatments. This would have been some time between 1910 and 1915. When she was finally released she was docile but never "all there" again. Her doctor thought having more children might be helpful, so my father and his two brothers were conceived. My aunts may have had faint memories of their mother before her illness, but my father and his brothers only knew her as she was after the "treatment". No one living when I started asking questions knew where Bessie had been institutionalized. I considered at one time checking with the various mental hospitals in the area to see if any of their records reached back that far. So far I haven't taken that step. HooRAH for you Nan! Completely tickled pink with your blog and this post was intriguing! Great story! I hope you will be able to uncover the rest of it one day! Glad to see you join the challenge. Great read and hope you can find the answers you seek.